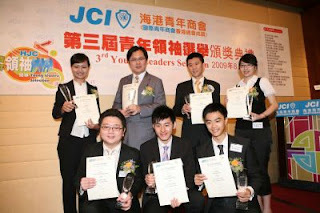 RFID Bloggy'n Tips: Congratulate to the Business Development Director of Hong Kong RFID Ltd.
Congratulate to the Business Development Director of Hong Kong RFID Ltd.
Mr. Craig Jo, Business Development Director of Hong Kong RFID Ltd. and also Vice Chairman of Young DAB has obtained the 3rd Youth Leadership Award of HARBOUR JUNIOR CHAMBER (HJC). Craig has foreseen that Hong Kong would undergo a transformation in which science and technology and innovation is of more emphasis as early as 2004. He resolutely created his own information technology company – Hong Kong RFID Ltd.; and with his continued efforts and perseverance the company's performance is now flourishing with good reputation and strong technical capabilities. The company has won the trust of many famous enterprises in being their system supplier and is heading for an even brighter prospect. Hong Kong RFID Ltd won the Hong Kong Awards for Industries in 2006, and the Hong Kong Information and Communications Technology Awards in 2007. Last year, Hong Kong RFID Ltd. has been chosen as a successful case of the Incu-Tech Programme by the HKSAR Government. Last but not least, Mr. Craig Jo would like to take this chance to thank his referee, Mr. Horace Cheung in the ceremony. Mr. Cheung has given him the opportunity and platform to realize his ambitions.